There sun is about to flip. In an event that takes place every 11 years, the magnetic field of the sun will change its polarity (in fact, this is already happening) sending a ripple of changing current way past Pluto, to the outer reaches of the heliosphere. At the peak of this cycle – what’s called a “solar maximum” -- there can be more dramatic aurora displays in the northern latitudes, power outages, and scared astronauts. And, at Stanford’s Wilcox Solar Observatory, scientists will be paying close attention. Todd Hoeksema directs the observatory, which has been monitoring the Sun’s magnetic field since 1975. Hoeksema, reached in his office, told KQED Science that this year’s reversal – “Cycle 24” – is a lot less dramatic than previous cycles, but still exciting enough to have him and others glued to their screens, watching sun spots come and go on the surface of our star. So when, exactly, is this flip going to happen? It happening right now. It’s a gradual process, not something that happens over the course of a few hours or even a day. It’s kind of like a tide coming in and out. When does it reach high tide? You can specify a moment after the fact, but as you’re experiencing it, you can’t tell so well. In six months, I’ll be able to tell you pretty closely at which point the sun reversed its polarity, but I can’t do it now. What does that mean to say that the polarity reverses? Magnetic fields point one direction or the other. And at the surface of the sun, they point into the surface, or out of the surface. And right now, the polar field in the south is changing from pointing out of the sun, to pointing into the sun. We call that going from positive to negative. It's is a big deal because the sun’s magnetic field is what determines how solar wind is organized, and solar wind goes all the way past the planets to the edge of the heliosphere. Which is the part of space that’s influenced by the Sun. Didn’t the Voyager 1 spacecraft just reach the edge of the heliosphere? There are two Voyager spacecrafts. And people are pretty sure that one of them has recently passed outside the heliosphere for the first time, past Pluto. The problem is that we don’t know what it’s going to look like outside the bounds of the heliosphere. So it’s a little bit hard to say for sure that you’ve done it. So the reversal, when it hits, will affect this entire heliosphere. Will we feel it here on Earth? Well the Earth has a really good shield, so changes in the solar wind and interplanetary magnetic field don’t affect us on the surface much. What you do see are changes in the Earth’s geomagnetic field. And that can affect our technological system. 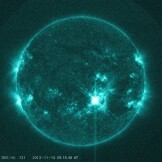 At solar maximum you see more solar flares and coronal mass ejections. Those can cause things like power outages. It can interfere with reception of data from satellites. Or even airplanes sometimes have trouble communicating at high latitudes. One of the most spectacular things you can see are auroras, so the northern lights will be more common at northern latitudes. People see those when there’s a lot of activity on the sun. 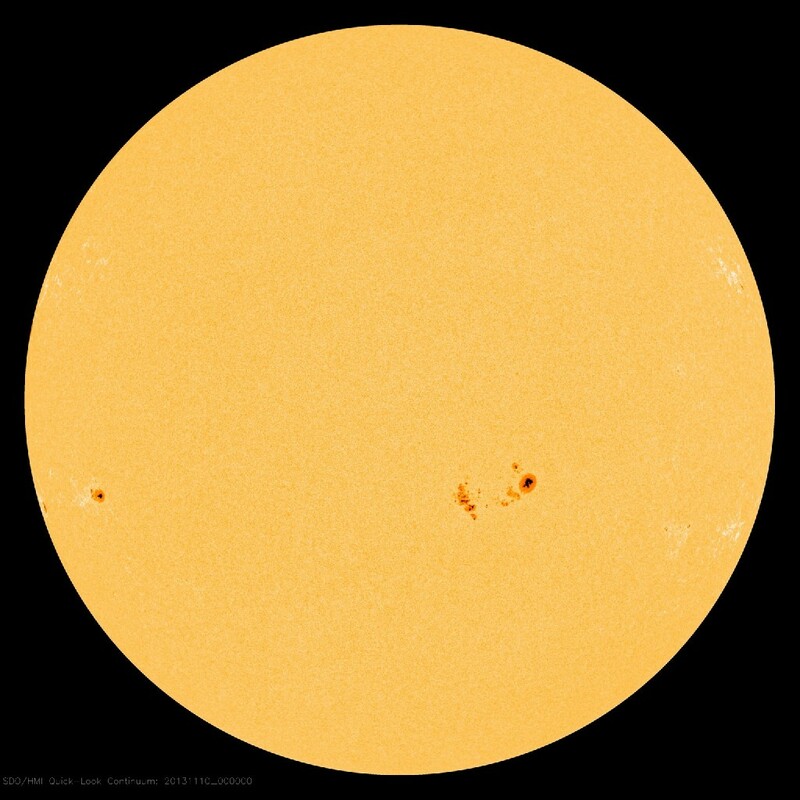 And when the solar maximum is happening, we also see a lot more sun spots. Yes. A sun spot is a large area on the surface of the Sun where the magnetic field is strong. They’re about the size of the Earth. And they’re dark because they're a little bit cooler than the rest of the surface. And that’s where the activity happens. When the magnetic field is complicated, you can get these big explosions [solar flares]. The interesting thing is when there are a few sun spots next to each other, that’s when you get the big explosions. But it sounds like this particular solar maximum has been a bit of a letdown, right? Based on past experience, we’ve probably reached, or are very close to the maximum this cycle, and it hasn’t been a very impressive one. There have been a few large storms – a lot of activity over the last couple weeks, for example -- but not many. So there may still be a big storm coming, but we seem to be at the peak, or just passing the peak of this cycle. NASA's Solar Dynamics Observatory captured this image of a solar flare on Nov. 10, 2013. This weak cycle is great for satellites, not so great for funding of space weather research. You know, in a bad year everyone sort of loses interest by the next time it comes around.